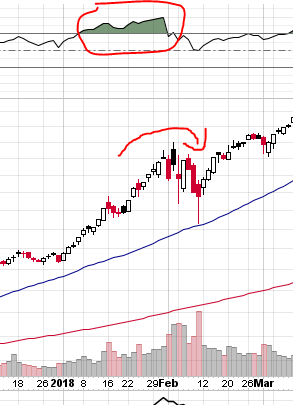 Over the holidays I was talking investments with family members, and the question came up as to whether I thought the RSI Indicator was of any use or not. To be honest, I responded I had never looked at it, so I couldn’t offer an opinion. Since then, I have been casually watching it, and I am now of the belief there may be something to it. In case you are not familiar with the Relative Strength Index (RSI) technical indicator, it essentially tracks short term momentum. This page provides a great overview of how it is calculated and its history. In summary, it flashes a sell signal when a dramatic increase has happened over 14 days, or a buy signal when a dramatic decrease happens over 14 days. The theory being that after 14 days of buying or selling, the inventory of people who would buy or sell is pretty much exhausted. Notice after the big run-up the RSI was over 70 (SELL!) and subsequently the market corrected. It then switched to a buy (RSI under 30) at the bottom. Note however that it kept going up after initially hitting the over 70 mark, so if you sold then it likely wouldn’t have worked. Amazon was the one that caught my eye. 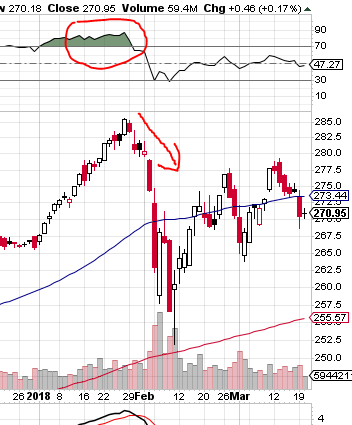 This was my first test case, as I was looking to reduce my exposure to Amazon anyway, I figured with the RSI over 70, that was a reasonable time to unload some shares. This didn’t work real well, since it dropped less than most stocks in early February, and it quickly recovered the loss later in February. Looks like it is following the classic pattern, and now the price is starting to break down. 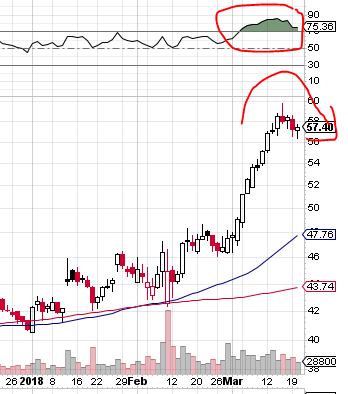 My working theory is that the strategy is to underweight a stock that has been over 70 RSI for 4 days. And consider overweighting a stock when it hits 30 RSI. Of all the charts I have looked at, that appears to be the formula based on the patterns. My next step is to start tracking RSI and backtest a number of different formulas to see if there is a pattern here. And if there is, I will plug it into my stock technical model. The above charts were provided by stockcharts.com. Try running some of your favorite symbols thru there and see if you find a pattern. I still am resisting technical analysis, it seems a little voodoo that this is all driven by emotion. But if I can nail down a pattern with this indicator, I might finally give in to the dark side of investing.